The U.S. has been experiencing many emotions throughout the past few weeks regarding immigration. Many undocumented immigrants have been keeping their children home from school even. They have even taken measures to stop attending after-school activities, weekend restaurant outings, and public events. This wave of nerves was released after a series of immigration arrests occurred this week. “There are people that I work with who essentially want to go dark,” said Cesar Vargas, one of the first immigrants without legal status in New York state to be sworn in as an immigration lawyer. Although the fear of undocumented immigrants has been said to have started after President Donald Trump’s inauguration, it was heightened after Thursday’s deportation of an undocumented Arizona mother of two who was making a routine visit with immigration officials. Then Immigration and Customs Enforcement agents carried out numerous actions this past week in California, Georgia, North Carolina, South Carolina, Texas, and other states. The arrests came after the court battle over Trump’s travel ban on immigrants from seven majority-Muslim countries. Although the arrests came to a surprise, Trump vowed to deport 3 million undocumented immigrants who have criminal records and then to build a wall across the US-Mexico border. 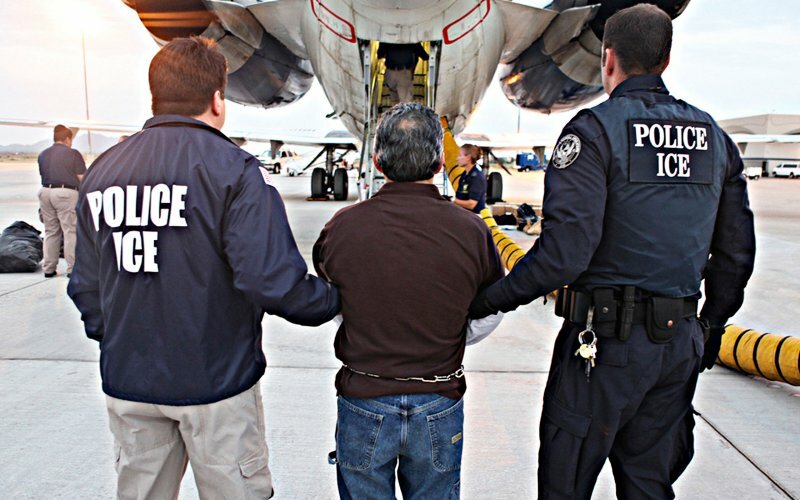 One of the ICE operations that took place this week in Los Angeles was targeted on criminals and fugitives. The agency said the majority of those arrested had criminal histories. They said that about 160 foreign nationals were arrested this past week. Out of the 160 arrested, 150 had criminal records, and of the remaining arrests, five had final orders of removal or were previously deported. ICE also reported that 95% of those arrested were male. By Saturday, January 11, 37 of the 160 have been deported to Mexico. Many of the supporters of the sweep are surprised that these actions have been making the news. A spokesman for the Federation for American Immigration Reform which is a non-profit that fights for reduced immigration and tighter borders, Dave Ray said, “President Trump campaigned on the issue of enforcing the nation’s laws, and that’s exactly what is happening here,” John Torres, a retired deputy director of ICE and long-time immigration agent, said the last time that there was such a huge spike in enforcement in US immigration was during the Bush administration, from 2006 to 2008. Torres said “What’s different here is that you have a more robust agency than you had 10 years ago, and the expanded scope of priorities now, coupled with the fact that you have far more jurisdictions that are not cooperating with ICE, is forcing ICE agents to make those arrests out in the community.” Although these arrests have been fearful for immigrants, the Obama administration also had a clear guidance prioritizing the deportation of high-level criminals. There was an executive order signed by Trump in his first week as President that set up enforcement priorities that could include virtually any undocumented immigrant living in the United States. This order can shake the fear of deportation into any of the undocumented immigrants living in America. The Trump administration has seen some backlash on his new federal law enforcement on immigration matters. Many of the largest cities in America have vowed not to cooperate with the requirements set. In the past, these cities have been known to be “sanctuary” cities, which applied to jurisdictions that have policies limiting cooperation with or involvement in federal immigration enforcement actions. Many of these towns, countries, and states have a range of laws and informal policies that qualify them as “sanctuaries.” In addition to sanctuary cities, the DACA program has also nationally helped immigrants become US citizens. The DACA program was put into place by the Obama administration; the DACA program has helped roughly 750,000 young people emerge from the shadows and obtain valid driver’s licenses, attend college and legally secure jobs with or without US work permits. This program has protected the children of undocumented immigrants and continued to protect them, but Trump has vowed to repeal the program. “We’re in major suspense with the Trump administration,” said Vargas, who was 5 when he crossed the border from Tijuana to San Diego. “What is he going to do with DACA? The program can be taken away any time at the discretion of immigration. They can say, even if he has DACA we’re going to pick him up because he is undocumented” said Vargas, who is still a beneficiary of the DACA program. Many US immigration lawyers have been working with undocumented veterans who joined the US military with hopes of obtaining US citizenship. Some of the veterans, which are green card holders who served in Iraq and Afghanistan did not go through the entire process of becoming citizens. Many of these veterans that return to the United States after serving the country now face deportation. Antonio, a man who asked not to use his full name, came to America 17 years ago from Mexico. He spoke about the fear going through undocumented immigrants right now. “People are not leaving the house to get a cup of coffee, to have dinner or take their children to the library. You don’t know when the next roundup will be. You go to work. You come back home.” He said many immigrants are extra cautious in the street, “I’m looking around all the time. It’s not only ICE but the police as well. What if they stop you and ask you questions?” Antonio, a construction worker, said he had paid his taxes for years. He also mentioned he was part of a small army of undocumented immigrates who toiled in the reconstruction in Queens and Staten Island after Superstorm Sandy destroyed the state. “We were among the first to respond to that catastrophe. We helped rebuild homes, and the owners still seek us out for work. But some people feel we’re taking away jobs. We take the jobs they don’t want. So it’s ‘Oh you helped me rebuild my house, but now I don’t need you, and you should go back to Mexico” Antonio said. Visa refusal and deportation has been the fear for many of these undocumented immigrants. For DACA kids they’re scared of their sanctuary benefits being taken from them. As said before, many immigrants are playing a waiting game with Trump as they are unsure when things will make such a drastic change in their life. Although currently, we are seeing mostly criminal undocumented immigrants being deported, we could see a change of direction onto undocumented immigrants, criminal or not. Are you interested in immigrating to America? Contact VisaPlace Today. All our cases are handled by competent and experienced immigration professionals who are affiliated with VisaPlace. These professionals consist of the best US immigration lawyers, licensed paralegals, and consultants who work for Niren and Associates an award winning immigration firm that adheres to the highest standards of client service.